Midfielder Michael Duffy admitted he was shocked to get a call up into Northern Ireland’s squad for next month’s World Cup qualifier against the Czech Republic. The 22-year-old is over the moon that he’s in Michael O’Neill’s squad and concedes he expected to be part of Jim Magilton’s U21 set-up. “It was unexpected but I’m delighted to be in the squad,” he said. “I have got off to a good start at Dundee and I have been playing but it never really came across my mind that I could get picked for the squad. The Celtic man, who is on-loan at Dundee, is hoping Northern Ireland’s Euro 2016 feel good factor continues and he concedes that he knows a few of the squad. “It’s a big campaign for us, especially with how well they have been doing, so it’s great to be involved in it,” he added. “Hopefully I can go away, do well in the training or whatever, see what happens and hopefully do enough to get into the next squad and stay there. “Look the group is hard and it’s going to be tough but look how well they did at the Euro’s group, so we are coming into positive anyway. 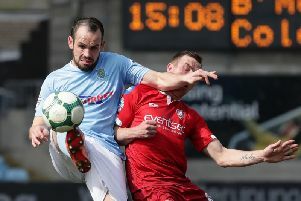 Duffy joins the likes of Maiden City men - Shane Ferguson, Paddy McCourt and Danny Lafferty - to be involved in a Michael O’Neill squad. “(Niall) McGinn is also in the squad and that’s good for people either playing for Derry City or from Derry itself that they are getting involved in the squad,” he said.